The O2 to Go! 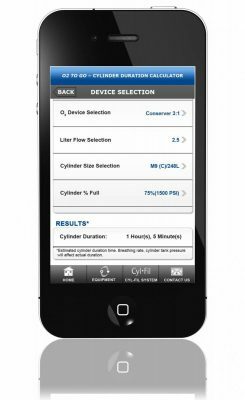 Cylinder Duration Calculator and Mobile App is available for use online or downloadable at the Mobile App marketplace for iPhone and Android at no charge. Easy to use online calculator and mobile App for oxygen cylinder duration estimation. The free calculator & app is ideal for technicians, therapists, patients and caregivers to easily calculate the approximate available oxygen remaining in an oxygen cylinder, based on the patient’s device and cylinders size & contents. Adjustable settings for a precise readout. Simply input your device type (Conserver or Regulator), Liter Flow Setting, Cylinder Size and Approximate Fill Level to calculate the approximate cylinder duration. Use our online O2 To Go Online Cylinder Duration Calculator below or download the mobile app for iPhone or Android for free! Input your information below to calculate the approximate cylinder duration.